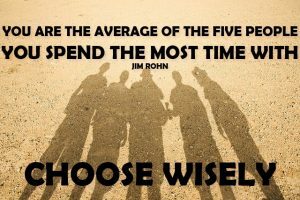 Jim Rohn has famously said “You are the average of the five people you spend the most time with.” When I first heard this quote, it had a real impact on me and caused me to really look at who was in my circle. I looked at my spouse, my close friends, my mentors and co-workers trying to decide exactly who I really did spend the most time with. When viewing things through this lens it really forced me to wonder where I was being influenced the most. My spouse is the obvious first person in my circle. While she does not necessarily share my enthusiasm for personal finance topics, she allows me to handle our family finances and supports me. This was not something that was easily handed over. When we first neared marriage and decided to merge our finances, each of us simply assumed that we would be the one to manage the family finances. We had each managed our own personal finances for some time and were confident in our own abilities. We had different family histories and different “styles” of management but in the end, we each trusted the other as much as we trusted ourselves. After some discussion, it was decided that I would take the lead on this portion of our lives, but my wife would be ready to step in if she did not agree with the direction things were going. We do not live geographically close to any immediate family from either side so the next tier of relationships that I was forced to look at were my close friends. In doing so, I noticed that I had a very strong support network but a mixed bag on how they handled their own finances. My network of friends also includes people that are at many different stages of life. Some have no children and focused on their careers exclusively, some had kids who were in the high school or college age groups, some had children in the age groups that include my kids and still some others had toddlers or newborn children. So, this analysis was not quite an apples-to-apples comparison. At the end of the day, I focused on those friends that either made personal finance decisions that impacted me, such as those who always wanted to do thing that negatively impact our finances, or those that had a similar interest in personal finance topics and were willing to share their experiences. Overall, I forced myself to really look at the decisions that my friend group made, and this gave me the resolve to stick to my convictions and say “no” to more things that would negatively impact my goals. Additionally, I have made an effort to spend more time with at least one individual that is a very positive influence. This person is in a similar place in their life as I am, and they are always willing to talk about ideas and life hacks that they are trying or have heard about. We try to get together at least once a month and I have gotten huge value out of those interactions. The last group that I had to review was my work family. This is a group that I spend the most time with since our work lives dominate most of our waking hours. I forced myself to truly look at this group and realize that it not only includes co-workers, bosses, mentors, etc. but also includes clients and networking groups where much time is spent. The thing I noticed the most with this group was the high percentage of pessimism that was present across the group. I think any large sample of people will have its share of pessimistic people, but the workaday portion of the population really seems to tip the scales. There are the usual negative ideas to contend with in the workplace where you disagree with decisions or direction of your organization, but it seems to go deeper than that. The overall attitude can at times seem almost defeatist. It makes me wonder if the scene is set for us. Maybe it is not these specific people but just the working majority overall. Can someone find happiness when they are forced to wake earlier than they would like to, leave their families, spend high-stress hours commuting and then spend the majority of your daylight hours doing things that do not necessarily contribute to their own happiness? Is the game rigged? What this analysis has done was further open my eyes that walking the path to a somewhat early retirement is the correct path. That retirement may mean different things to different people and may not even mean a separation from work as a whole. Perhaps it can mean doing work on your own terms, separated from the need to make as much money as possible to ensure that you can cover your family’s monthly expenses. While I do not feel that an analysis of my inner circle is a task that has a distinct beginning and end, this current review definitely was fruitful. It gave me resolve to defend my goals, motivation to spend more time with positive influences and perhaps most importantly, allow me to spot and reduce the negative influences. Remember in a previous post where I explained that I was “good with money?” I feel the need at this point to remind you, the reader, of that sentiment. Funnily enough, the need to reinforce that comes once again as I retell a story of a money mistake from my past. While I was always fairly conservative financially and focused on obtaining a strong career path and funding a retirement account, etc. my younger brother seemed to be cut from a different cloth. He spent much of his twenties and early thirties working in bars, most in New York City. He spent time as a bartender but really seemed to hit his stride when he got into promotions. He seemed to have a knack for attracting crowds to the establishment he was promoting and was paid extremely well for this work. He continued working in this field and eventually moved into management positions. Eventually, that work appeared to pay off when he had the opportunity to buy his own bar. He turned on his promoter skills and dialed his favorite (only) brother and asked if I were interested in investing. The idea of owning a piece of a bar in New York City was pretty attractive. While I was living in another state at that time, I had visions of myself visiting, walking past a long line of people waiting to get in; overhearing them asking each other who I was and why did I get to cut the line. Typical ego-boosting type thoughts. I think you can see where this is going…. I took the plunge and invested. We encountered all the issues that any new business does and there always seemed to be a need for more and more money to get things off the ground. After what seemed like an eternity, we were set for a grand opening. The place looked great and was getting some decent buzz. Well, decent for a place of its size at least. The fairy tale was not meant to be however, and things never really took off. We trudged along for some time but never really got ahead. I tried to ask some questions about the finances but quickly learned that my brother and I had very different ideas about running a business. In rough times, my inclination is to attack costs and see what can be eliminated or reduced. In other words, I like to play DEFENSE. My brother, however, felt that there was no money issue that couldn’t be fixed by attracting more revenue. He came up with new and interesting ideas to stoke the flames of customer interest. Many of these ideas required spending even more money. “You have to spend money, to make money” seemed to be the mantra. Obviously, he liked to play OFFENSE. So, which is the correct method? To be successful, I believe you need to play both offense and defense and find a happy balance between the two, but I just don’t think any one person can be wired to do both on the same level. What are your thoughts? Where do your strengths lie?